Bella+Canvas 3/4 Sleeve Baseball Tee (#3200). Wear a piece of Canadian history with a shirt that reflects one of the biggest sporting moments in decades. 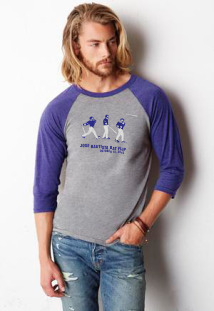 6.4oz 50/25/25 polyester/cotton/rayon shirt; combed and ring spun cotton with contrast raglan sleeves and neck trim. Unisex sizing. (this is the shirt being shown here). You can also get a Men's Gildan 6400 Softstye crew neck shirts 7.5oz , 100% cotton preshrunk jersey knit. Womens crew neck shirts are Gildan 640L.